arrangements of classics that are tested. The show often begins with acoustic, somber and introspective songs and eventually gives way to storytelling, raunchy rock and comedic breaks. But anything goes?really. And, that is exactly what the audience loves about Bob Schneider. Bob's recording career spans some 20 albums, which include eight solo albums and those with his bands, all of which are legendary in the [placeformed]Austin, Texas[placeformed[ music scene of the 90's, The Scabs, Joe Rockhead and The Ugly Americans. There are many peaks within these albums but Lonelyland (2001) and I&rsquo;m Good Now (2004) stand out at as the ?mainstream highlights? while album artist=Bob Schneider]The Galaxy Kings[/album] (2002) and Underneath The Onion Trees (2000), are beautiful ?artistic statements? and fan favorites. If you take a journey through this collection of albums you'll discover an artist with no boundaries. Bob's repertoire covers a spectrum of musical styles?. mambo, rap, blues, country, Latin, swing, soul, even bluegrass?. all done with the aplomb of a virtuoso of any one of those musical genres. Many of these genres are explored on Bob Schneider's new album, Tarantula. Tarantula sparkles with songs that reflect a songwriter, artist and entertainer at the peak of his creative heights. It is a new apex in Bob's album catalog and stands alongside Lonelyland and I'm Good Now as one of his best. Fans will know ? 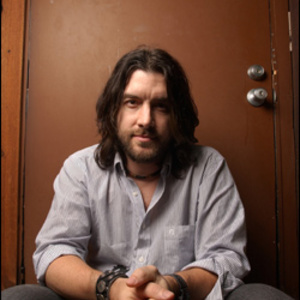 ['track artist=Bob Schneider]Tarantula[/track]? as the name of the song that has been Bob's live signature for years. It's the part of the show where the audience jumps to their feet, dances in the aisles, howls at the moon and sings the refrain along with Bob. Sheer fun. The song has never been available on a studio album so fans will know right away that they are in for a treat. Those lucky enough to have been at the Saxon the night that the lead single, ?40 Dogs (Like Romeo and Juliet)? was debuted knew right away that they were in for something special with this album. There is a beautiful heart-rendering break-up song, ?Changing Your Mind,? with Patty Griffin lending even more rue. ?Trash? and ?Bicycle Vs. The Car? both prove again that Bob is a master of pop hooks, melody and inspired wordplay. He was born in Michigan but moved to Germany when he was two where he grew up attending Catholic school. His father sang opera and his mother taught school. He left Germany as a student to attend art school at the University of Texas/El Paso. He dropped out and moved to Austin where he struggled around as a musician before gaining some national recognition via his punk-funk band Joe Rockhead. He signed to Capricorn Records as the rock n'soul band, Ugly Americans, and nearly simultaneously formed The Scabs with a band of infamous Austin neo-legends known for (and still performing) their outrageous live shows. In 1999, Bob took a solo turn to explore his introspective singer/songwriter side, and in 2001, Republic Records signs him after Lonelyland, explodes in his hometown and becomes (and remains) the biggest selling album in the history of Austin's infamous Waterloo Records. A couple of self-released ?artistic exploration? albums are released before, I'm Good Now[/album], is released on Vanguard in 2004, and there is another flirt with mainstream chart success with the singles, ? [track artist=Bob Schneider]Captain Kirk? and ?Come With Me Tonight.? He has built his audience by touring relentlessly and over the years has opened for the Dixie Chicks, Stevie Nicks, Sheryl Crow, Dave Matthews and the H.O.R.D.E Tour, but mostly through headlining club and theater tours. Bob will be on tour in May and June of 2009 playing songs from the new album, Tarantula.